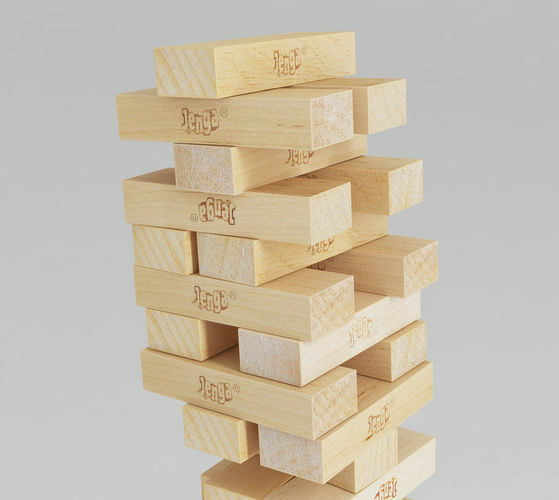 3D model of a Jenga Game. 7 different 2000x2000 textures. We enclosed a psd so you can easily remove the Jenga logo if needed. 2 sets of Jenga tower, one is the start of the game shape, the other one is an already finished game. Both consist of 54 pieces just as the original game. All the pieces' shapes are a little bit different and the stacks were put together by hand so it looks random and life like. Enclosed a few different format like FBX, OBJ, see what works best for you. Let us know if you need any help! Jengaaa!! My favorite game.. Nice model. Thank you for your comment! ;) Have a nice day!